This year Sage had its regional partner conference for Australia, New Zealand and the Pacific Islands in Wellington, New Zealand. This is the first time this conference has been held outside of Australia and was a great success. Since we were there already, we also had a customer conference a day before the partner conference started. The customer conference is Sage Summit and the partner conference is Sage Insights. After Wellington, Sage had two more customer Summit conferences in Sydney and Melbourne. Wellington is located on the southwestern tip of New Zealand’s North Island. It has a population of around 400,000 people and is the capital of New Zealand. 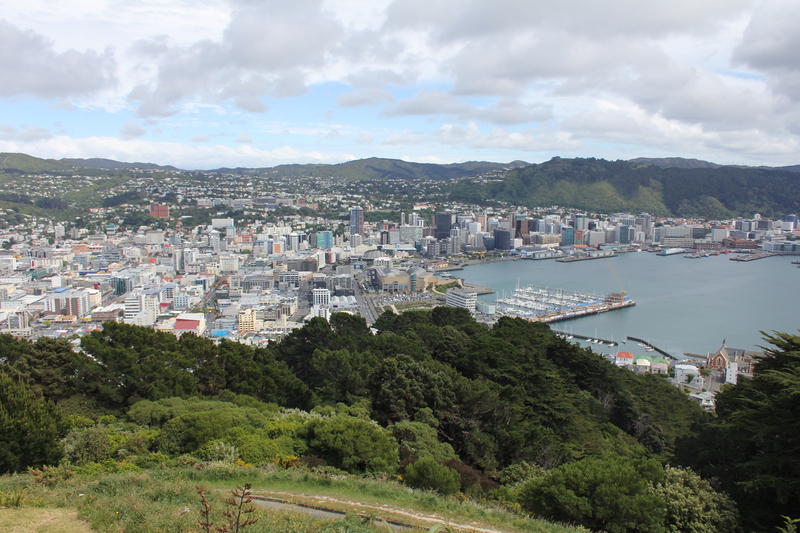 Wellington is a very compact city with the downtown nestled between the harbor and some hills. I took the picture above from the top of Mount Victoria looking back on downtown. You can easily walk from one side of the main downtown area to the other. It’s a fun place with a very vibrant arts scene, café culture and nightlife. While we were there the city was gearing up for the global premier showing of the new Hobbit movie which will be a giant party, unfortunately we were ten days to early. 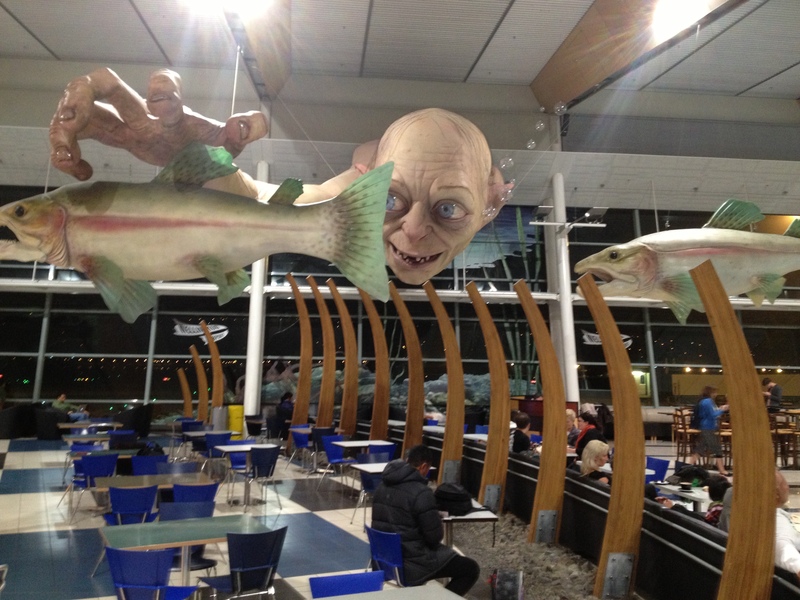 Certainly Lord of the Rings and the Hobbit are playing a large part in New Zealand tourism promotions and attractions around the country (see the picture at the bottom of the giant Golum over the cafeterias at Wellington airport). 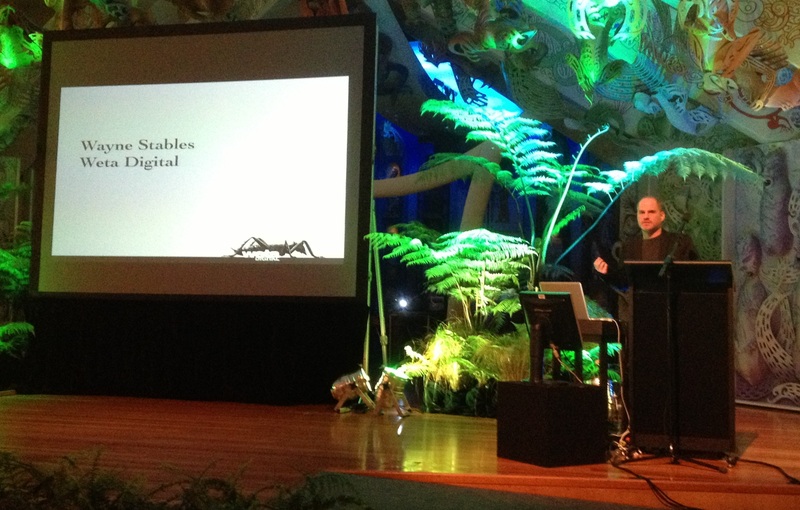 The guest speaker at the gala awards dinner was Wayne Stables from Weta Digital. Weta did the special effects for movies like Avatar, Lord of the Rings, Prometheus, The Avengers, Tintin and Rise of the Planet of the Apes. Amazing work and many academy awards received. Interesting to see their development processes. They are preparing for the work on Avatar 2 right now, working on what is really their DevOps process to streamline the production of software into the video workflow. Interesting to think about their tight deadlines and how they have to deliver top quality each time. Since they are a separate entity from the studios, they have no job security from job to job. In business software we aren’t producing anything as beautiful as Avatar, but at the same time we want to produce screens with an excellent user experience, but at the same time deliver software to end users very quickly. I think that we can learn a lot from the movie and video games industries on how to deliver higher and higher quality user experience, but still stick to tight deadlines. The Sage ISV community is very active in Australia and New Zealand. Some local representatives exhibiting were Technisoft, Pacific Technologies, Enabling IP, Orchid, Redmap, BSP Software, InfoCentral Solutions, Modulo Software, Netfira, On Center Software, Wageeasy and XM Developments. Then there were a number of exhibitors that had travelled from other regions including Iciniti, AutoSimply, Accellos, ACDEV Software, Accu-Dart, Altec, Enbu Consulting, Global Software, idu Software, Netstock, Tema Business Systems and Vineyardsoft. There were several new SDK modules on display. It’s great to see accounting modules for new verticals making it to market and new bits of functionality being added to the existing solutions. Plus there were several additional ISVs that attended but didn’t have booths. Redmap is an interesting ISV. They became an ISV by becoming a Sage customer first. They were originally a Netsuite customer, but the spiraling costs of Netsuite drove them to look for another solution and they chose Sage ERP X3 (see the articles here). Redmap creates a document automation and management solution. Now that Redmap is a Sage customer they decided to integrate their solution to Sage 300 CRE, Sage 300 ERP and Sage X3 ERP and to market this solution globally. As part of the keynote, myself and Mike Lorge the Managing Director talked about the Sage Hybrid Cloud and showed off a number of connected mobile services running against this cloud. I blogged on the Sage Hybrid Cloud here. It’s always nail biting to demo something at a keynote that relies on an internet connection. I demo’ed the Service Billing connected service from my iPhone 4S, I just turned on data roaming for the demo, since then I didn’t need to worry about hotel Wi-Fi and the 3G seemed to work fairly well in Wellington. Keith Fenner demo’ed the Sales Manager service on his iPad connected to hotel Wi-Fi, which actually held up. So we got through that with the connections from the devices to the projector working and the internet connectivity working. Certainly adds some new challenges to giving presentations. On the other hand we are telling businesses that these are reliable services that are available 99.9… % of the time, so we should be confident they will work during keynotes and other demos. We also showed the Sage Connected Services Vision video which is on YouTube here. The keynote also covered the latest releases of Sage CRM, Sage 300 ERP and Sage ERP X3 along with some peaks as to what will be coming in future versions. Sage 300 ERP 2012 has just been released in this region, so people are just starting to get it. So this was a good time to highlight this release and point out all the various features, plus we also talked about the roadmap for the next 3 years. Sage CRM showcased some exciting developments with CRM running optimized for mobile devices as well as showing the next generation of social media integration. Sage X3 ERP highlighted many relevant features in the current version and gave a video of the Syrapedia feature coming in version 7. All the partners, customers and staff from our Australia, New Zealand and the Pacific Islands region are very enthusiastic and dedicated to what they do. It is always very energizing to attend such conferences and have the chance to interact with so many people. I have tons of feedback to bring back on our products and our processes that hopefully we can incorporate to keep a real positive feedback loop going. We introduced the concept of the Sage Hybrid Cloud along with a number of connected services at our Sage Summit conference back in August. This is intended to be a cloud based platform that greatly augments our on-premises business applications. This blog posting will look at this platform in a bit more depth. Keep in mind that this platform is still under rapid development and that things are changing rapidly. If we think of better ways to do things, we will. We are approaching this with an Agile/Startup mentality, so we aren’t going to go off for years and years and develop this platform in a vacuum. We will be developing the functionality as we need it, for our real applications. This way we won’t spend time developing infrastructure that no one ends up using. Plus we will get feedback quicker on what is needed, since we will be releasing in quick cycles. Below is a diagram showing the overall architecture of this platform. We have a number of cloud services hosted in the MS Azure cloud. We have a number of Sage business applications with a connector to this cloud. Then we have a number of mobile/web applications built on top of this hybrid cloud platform. 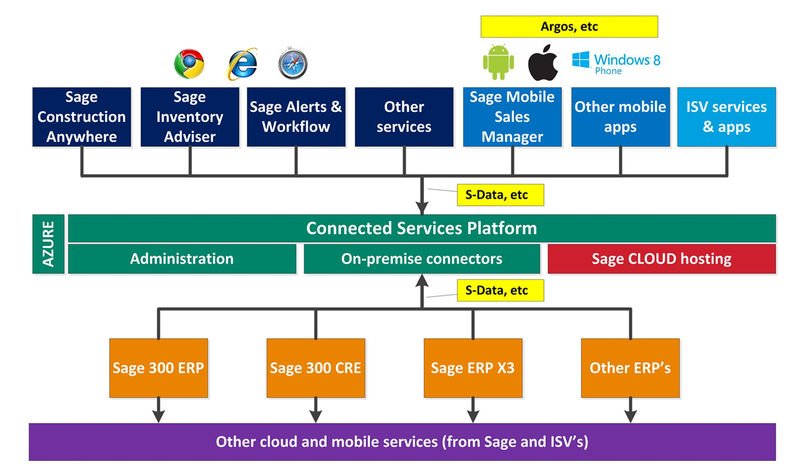 Notice that pieces of this platform are already in use, with Sage Construction Anywhere (SCA) being a released product and then Sage 300 CRE already having a connector to this cloud to support the SCA mobile application. The purple box at the bottom represents our current APIs and access methods, and just re-iterates that these are still present and being used. The red box indicates that we will be hosting ERPs in this environment in a similar manner to our current cloud offerings like Sage300Online.com. We’ll talk about this in much more detail in future blog posts. But consider this Sage hosted applications version 2.0. These mobile applications aren’t just current ERP screens ported to mobile/web technologies, they are whole new applications that didn’t exist before these powerful mobile devices came along to enable these ideas. Each ERP needs to connect to the Hybrid cloud, this is to upload files for items that are needed for lookup in the cloud devices like for finders. As well as to download transactions to enter into the ERP on the connected application’s behalf. The intent is to have one connector for each business application, rather than having to install and configure a separate connector for each connected service (which we hope there will be dozens of). We want to keep the TCO of the solution as low as possible. To this end we don’t want the end user to have to configure any firewalls, DMZ or web servers. The connector will only call out to the cloud platform. There will never be calls into the connector. Additionally you only need to configure the connector once with your SageID and away you go. The connector will use SData Synchronization to synchronize the various files. This way it doesn’t matter if your on-premises ERP is off-line, it will catch up later. This makes the system much more robust since your mobile users can keep working even if you turn all your computers off completely. We will use SData as the communications mechanism from the hybrid cloud. The cloud will host a large set of SData feeds to be used either by the mobile and web applications or by the on-premises ERP connectors. Since SData is based on industry standards like REST, Atom, RSS and such, it means it’s easy of pretty much any web or mobile based framework to easily use it. All modern toolkits have this support built in. Plus we provide SDKs like the Argos-SDK that have extra SData support built in. The intent will be that ISVs can use the SData feeds from the Hybrid Cloud as well to develop their own applications or to connect existing cloud based applications to all our Sage business applications. However we won’t start out with a complete database model, we will basically be adding to this cloud data model as we require things for our Sage developed solutions as well as for select ISVs. The intent is to get common functionality going first and then fill it in with the more obscure details later. For instance most connected services will need to access common master files like customers, vendors and items. Then most connected services will need to enter common documents like orders and invoices. The feeling is that most integrations to ERP systems actually don’t access that many things. So the hope is that once the most common master files are synchronized and once the system accepts the most common transactions, then a great number of applications will be possible. There will also be parts of the cloud database that don’t have any corresponding part in the ERP. There will be a fair bit of data that resides entirely in the cloud that is specific to the cloud portions of these applications. When you are signing on to all these various connected services, we don’t want you to need a separate login id and password for each one. We would like you to register a user-id and password with Sage once and then use that identity for accessing every Sage connected service. Ultimately we would like this to be the user id and password that you use to sign-on to our on-premises applications as well. Then this would be your one identity for all Sage on-premises and cloud applications. Then all your access rights and roles would be associated with this one identity. The Sage Hybrid Cloud is an exciting project. The concept is that it’s starting small with the Sage Construction Anywhere product already shipping and then going to develop quickly as we add other services. This should go quickly since we are leveraging the R&D resources of many Sage products to get new exciting mobile products into market quickly spanning the customer base of many Sage business applications. I’ve been writing this blog for nearly four years now. I’ve written 175 articles and there have been 940 comments (many of these responses by myself). This is a bit of a self-indulgent article on my experiences blogging. Partly because I think blogging is a great communications mechanism and partly because I need a topic this week. I’ve managed to get my readership up to a bit over ten thousand views per month now, which given the specialized topics I blog on, I tend to think is pretty good. 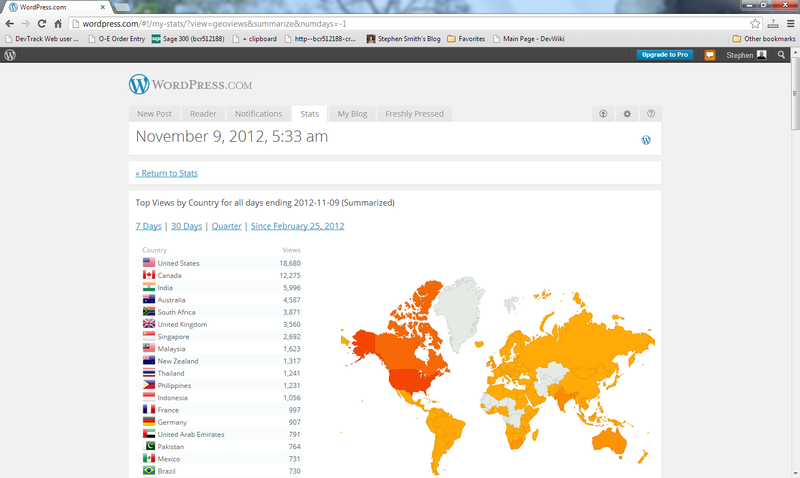 I get a quite varied readership with all parts of the globe being represented. I use WordPress. I didn’t do a lot of research to pick it, I just noticed several blogs that I liked used it and gave it a try. I found it really easy to get going and have basically stuck with it since. It’s important to keep your blog URL the same so people can continue to find you. I never paid for a personalized URL, so if I ever did want to switch away from WordPress it would be hard, since I would need to change the URL of my blog. I’ve only ever used the free version/functionality and never paid for anything, though WordPress makes some money off me by having a few adds on my blog now and then. I write my articles in MS Word. Then I copy/paste them into WordPress. WordPress preserves most of the formatting so I don’t need to reformat things usually. Sometimes it messes up, but I tend to keep the formatting simple so I don’t confuse it. The pictures don’t copy across, so I need to insert them separately when done. I don’t really like the contents/indexing of blog articles that WordPress provides, so I use the custom page feature to keep some tables of contents and directories of articles more in a way that I prefer. When you start a blog and post it on a site like WordPress, even if you don’t do anything, you will still get a few views, even if it’s only a dozen a week. So how do you get readers? How do you keep them coming back? There are a lot of articles and blogs on how to promote blog readership, but these are a few things that I find work. Google is king. Most of my views come as the result of Google searches or Google image searches. Usually several hundred from Google and then one or two from Bing, Yahoo, AVG Toolbar, etc. Towards getting good Google results, check your page rank (using the Google toolbar or the Chrome application). If you’re not progressing (from 0 to 1 to 2 to 3) over a year or so, you might need to rethink things. Make sure you get your friends to link to your blog from any blogs or websites they have, since Google largely rates things by how many other sites link to it. LinkedIn is a great way to promote your blog. If you know your audience and can connect to your audience via LinkedIn, then they will see notifications of your posts on LinkedIn, as long as you set it up correctly. Posting notifications on relevant Facebook pages generates a few views, but at least for me, the audience is wrong and I don’t get many views this way. Reddit. Since Digg died, Reddit is supposedly the main referral site for articles. However most blogs are just rejected by the various topic editors and it’s very hard to keep good referrals here. I’ve only managed to do it once, but it did payoff with a record day. But generally I find Reddit too much work. Write regularly. If you write regularly then people will subscribe to your blog to be notified either by e-mail or RSS every time you post. Subscribing readers are the best kind of readers. Plus Google (see #1) favors sites that keep posting original content. It doesn’t take long for all that content to add up to a pretty sizeable set of reference material. Build a twitter following. Tweeting is a great way to promote your blog. I found Twitter worked better a few years ago. My theory is that so many people tweet now, that your posts tend to get lost in the general sea of tweets. Google is putting a bit more weight into social media references, so it can’t hurt. There are sites that claim if you pay them, they will find you all sorts of readers and send your viewership skyrocketing. I don’t really believe this and have never paid for such a service. I’ve also never paid for things like Facebook or Twitter to promote my posts. Have relevant keywords. But don’t go overboard. There has been so much abuse of HTML keywords, that most search engines just ignore them and go for the content. A few good keywords is good, but if you add every word in the dictionary it just makes your page slow to load and the search engines will ignore them. The search engines are much better at deriving these from your content these days. Generally unless you are a celebrity (or blogging about celebrities), your number of viewers won’t be in the millions (or even hundreds of thousands). But getting a readership in the thousands or tens of thousands isn’t that hard. It just takes consistency, good content and a bit of perseverance. Also remember that if you are blogging on a technical topic, your whole total audience may not be that big, due to the high levels of specialization we see these days. WordPress now will categorize your readership by country. This is based on your IP address which isn’t perfect. At our Sage Richmond office, our internet is routed through Irvine, CA. So if anyone in the office (in Canada) reads my blog then it counts as US (since this is how the IP address is assigned). My readership tends to follow proportionately where Sage 300 is successful. But there are a few anomalies. Strangely I get quite a few views from Brazil, even though we’ve never really sold Sage 300 there. Blogging software like WordPress is great for providing you all sorts of statistics. Like tracking your viewers over the years, telling you which countries follow your blog the most, telling you who is referring people to your blog. I find keeping an eye on these statistics is very addictive. Plus it’s a great feedback mechanism where you can experiment and then get some real data on what the affect is. Blogs are a great way to get feedback. People are quite willing to share their thoughts with you. Generally it’s a good idea to prescreen comments to eliminate spam and other unsavory remarks. It’s amazing how many online scams try to propagate by posting comments on blogs. I do try to answer most of the questions posted to my blog. But remember it isn’t tech support. When you open a tech support ticket, it is tracked and they will keep working on it till it’s solved. For my blog I might not have any idea and not answer, or I might be busy and it falls through the cracks. Or it requires more back and forth than can be achieved via blog comments. Also remember that blog comments aren’t a replacement for on-line forums, these are much better at gaining answers from a community of people. One of the goals of my blog is to reduce tech support, but blogging on topics that give people trouble or by blogging on ways to troubleshoot problems. But in the end if you really do need an answer and you need things to be followed up and escalated then please do call tech support. I find blogging a very rewarding activity. One saying that I take to heart is that you don’t really understand a topic until you can teach it to someone else. I find I learn a lot researching for blog posts and that it can really crystalize my thinking when going through the process of writing an article. Plus it is enjoyable to attend conferences and have people come up to me and say that they regularly do read my blog.